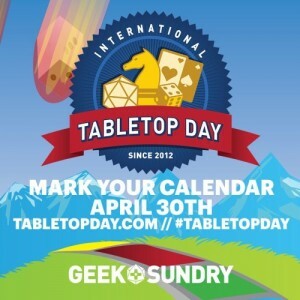 Geek & Sundry’s International TableTop Day will return on April 30, 2016! Gather your friends and join us for a day-long celebration of all things TableTop gaming. From quick card games, to intensive board games, to all-day RPG sessions, any game is the right choice for this day of merriment. Play by the book, or make up your own house rules. There is no wrong way to play. Except cheating. Unless of course you’re playing Munchkin, then by all means. Need ideas for what to play? Check out past episodes of TableTop to discover a new game and learn how to play.